The MSCI Emerging Markets Index added 0.7 percent to 1,029.80 as of 2:25 p.m. in Hong Kong. (Bloomberg) — Emerging-market stocks advanced to a six-month high as Chinese developers rallied and Philippine shares headed for a bull market. Indonesia’s rupiah led developing-nation currencies higher. China Overseas Land & Investment Ltd. and Greentown China Holdings Ltd. jumped at least 4.9 percent in Hong Kong after the nation’s central bank asked lenders to expedite home loans. Ayala Land Inc. surged to an 11-month high in Manila as the Philippine Stock Exchange Index climbed more than 20 percent from its August low. South Korean stocks jumped 1.4 percent as the won reversed earlier gains amid speculation the authorities intervened. The rupiah strengthened the most since March. Indian equities retreated from a record. 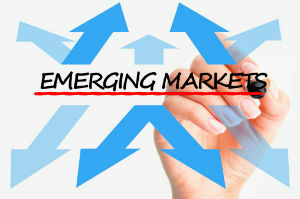 The MSCI Emerging Markets Index added 0.7 percent to 1,029.80 as of 2:25 p.m. in Hong Kong. The People’s Bank of China called on the nation’s biggest lenders to accelerate mortgage approvals as Premier Li Keqiang seeks to ease a slowdown in the world’s second-largest economy. The Philippine stock index has emerged as Asia’s best performer this year after winning a credit-ratings upgrade from Standard & Poor’s. The Chinese central bank’s move is “a sign of easing in the property sector and we need to see more follow-up measures such as the loosening of purchase restrictions to fuel a broad- based rally for stocks,” said Wu Kan, a fund manager at Shanghai-based Dragon Life, which oversees about $3.3 billion. The developing-nation gauge has increased 2.6 percent this year and trades at 10.7 times its 12-month projected earnings. The MSCI World Index of developed-nation shares has climbed 2.3 percent in 2014 and is valued at a multiple of 14.9. All 10 industry groups in the developing-nation gauge advanced, led by financial shares and utilities. A measure of technology stocks was poised to reach an all-time high. China Overseas rallied the most since March 21 and Greentown headed for its steepest increase in a month. The central bank’s request to improve lending efficiency comes as an economic slump worsens, with unexpected decelerations in industrial output and investment growth. The Hang Seng China Enterprise Index of mainland companies listed in Hong Kong surged 1.8 percent, poised for the largest advance since March 24. The Philippine Stock Exchange Index added 0.6 percent, taking its gains this year to more than 17 percent, amid speculation that improving public finances will help extend the nation’s best stretch of economic expansion since the 1950s. Ayala Land rose 2.8 percent today. India’s S&P BSE Sensex index slipped 0.2 percent after a 6.9 percent rally over the previous four days as exit polls showed a Bharatiya Janata Party-led alliance probably won 249 to 340 seats, with 272 needed for a majority. The results will be announced on May 16. The CNX Nifty Index lost 0.1 percent, halting a four-day gain. The surge in Indian stocks that turned the Nifty index into Asia’s top performer is nearing an end, according to Tom DeMark, the creator of indicators to show market turning points. The Nifty hit a level yesterday that signaled gains are “exhausted,” DeMark said in an interview, citing his Combo indicator. The index may increase about 3 percent in coming days, before reversing course to post an 11 percent retreat, DeMark said. The Jakarta Composite Index added 0.9 percent. The rupiah appreciated 0.6 percent on speculation Indonesia’s presidential candidates will announce their running mates today, reducing political uncertainty. The nation’s deposit insurance agency raised its maximum guaranteed rate to 7.75 percent yesterday, from 7.5 percent. The Kospi climbed to the highest level since Dec. 30. The won sank 0.6 percent. It has strengthened 3.7 percent against the dollar this quarter, the most among 31 major currencies tracked by Bloomberg, and trade minister Yoon Sang Jick said today that appreciation was hurting the nation’s smaller exporters. Finance Minister Hyun Oh Seok said the government would help protect these companies against volatile swings in the exchange rate. The FTSE Bursa Malaysia KLCI Index advanced 0.5 percent, heading for a record close. Vietnam’s VN Index climbed 2.8 percent while equity gauges in Thailand and Taiwan gained at least 0.6 percent.